Emily Taylor becomes severely depressed with emotional episodes and suicide attempts. Her psychiatrist, Jonathan Banks, after conferring with her previous doctor, eventually prescribes an experimental new medication called Ablixa. The plot thickens when the side effects of the drug lead to Emily killing her husband in a “sleepwalking” state. A psychological thriller that has a slow start and in which the entire pharmaceutical industry is questioned. The commercialization of chemically synthesized pills is shown plainly here. The pharmaceutical industry only cares about one thing, and that’s not the welfare of the patient, but the welfare of their own wallet. I actually could use a little pill in the beginning, because the first half was terribly boring and meaningless. Besides the sometimes beautiful images, I was wondering where this movie actually was leading to. Emily suffers from a grim depression. In the past she already got a treatment for that. One can assume that all of this has to do with her personal problems: a husband in prison for stock fraud (I guess that’s his crime) and a miscarriage. Rooney Mara is strikingly good-looking and pleasant to look at. 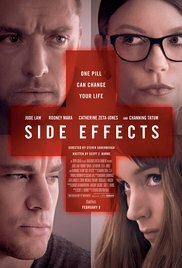 After a suicide attempt, she goes to the psychiatrist Banks (Jude Law) who prescribes her the new drug Ablixa. This seems to help until Emily, in a supposedly absent state, kills her husband. After that, the movie switches into a higher gear and it appears to be about a cunning conspiracy involving a fraudulent scam with shares and a lesbian relationship between Emily and her former psychiatrist, played by Zeta-Jones. I must admit it was a bit confusing for me at one time (without any pill) and I lost track a bit. Eventually, I thought it was a brilliantly put together plot and cleverly done how the savvy Blake got control over it. In retrospect, it was an excellent movie and worth to watch. The cast was excellent and at times Rooney Mara and Jude Law played brilliantly. The dilemma that bothers Banks was beautifully worked out : or he saves his career at the expense of Emily, or he looses his reputation because of sticking to his theory. The way he fights back from a hopeless situation into a determined victor, was a bit excessive. Furthermore, I thought that his marriage and the departure of his wife wasn’t a useful addition to the story. Not an extremely exciting movie, but one that stays stuck in your memory.